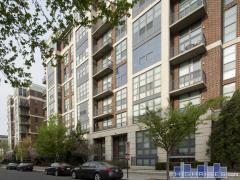 Welcome to high-rise living in the heart of DC’s Penn Quarter neighborhood. Completed in 2005, The Cosmopolitan offers 46 unique units with hardwood flooring, stylish contemporary lighting, large windows, walk-in closets, spacious bathrooms, air conditioning, washer/dryer connections, and gas appliances. The building itself offers residents numerous urban living amenities, including common-area Wi-Fi, garage parking, a pet-friendly policy, a clubroom and fitness center, and a rooftop deck where you can cook and grill while taking in spectacular views of downtown. The best amenity at The Cosmopolitan: You’re one block away from the Gallery Place Metro and within walking distance of the Metro Center station, giving you access to almost every line available for convenient commutes. Don’t forget to take advantage of entertainment and dining features that bring the neighborhood such acclaim, including hand-made noodles at Chinatown Express, concerts at the Verizon Center, high-end shopping at CityCenterDC, art films at Landmark Theaters E Street Cinema, Middle Eastern small plates at Zaytinya, theatrical performances at Shakespeare Theatre Company, and pomegranate margaritas at Rosa Mexicana. Have any comments or questions about The Cosmopolitan? Ask your question and/or share your thoughts about this Building.